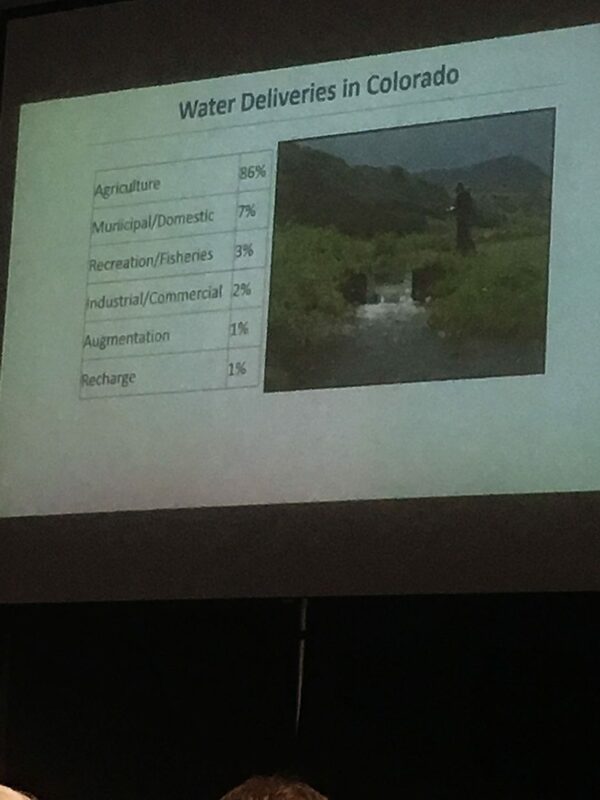 Commissioner Don Brown’s slide shows the breakdown of where Colorado’s water is distributed between. Coloradoans know that a majority of the more than 80 percent of the state's water is dedicated to agriculture and some think that is a problem. However, Colorado Agriculture Commissioner Don Brown said looking at the percentage breakdown of water use doesn't tell the whole story. Brown said people forget that water is used to produce food, and the water dedicated to agriculture spreads further than the immediate area where it is being used. The same can't always be said for water use in urban areas. The Colorado Ag Water Alliance's biannual summit aims to educate people on the uses of water in agriculture. The summit was held Dec. 5 in Loveland, Colo., and included speakers from different aspects of agriculture and groups interested in how Colorado uses its water resources. As the added strain on water resources continues with the urbanization of Colorado, agriculture is often the first place municipalities will turn to secure water resources. But, Brown said, people don't always realize that most of the water usage in Colorado agriculture goes into food production in one way or another. People don't always see the synchronicity. Becca Jablonski, a professor at Colorado State University in the agricultural and resource economics department, said part of the discussion around public perception should be about connecting food with agriculture again as more people are removed from the farm. As Brown alluded to in his opening remarks, people might see how much of the state's water goes toward agriculture, but don't connect that with the task farmers have of using it to grow food. At the same time, Carlyle Currier, chairman of the Colorado Ag Water Alliance, said the agriculture community doesn't want to negate the importance of other uses of water. "Keeping water in agriculture is just as important as keeping it in municipalities," he said. There just needs to be a balance, and speakers at the summit stressed that farmers and ranchers understand the importance of conservative water use. "Irrigated land in Colorado is pretty darn important," said Gary Teague, a cattle feeder from Fort Morgan, Colo.
Teague said agriculture is one of the few industries "where you are incentivized everyday to do a good job." If there is mismanagement on a field or with water use, that eventually comes back to burn producers. If they don't work toward using the water in the most conservative and practical ways, it will eventually come back to hurt them. Plus, he said, it would be more beneficial for industries to move to rural areas rather than urban areas. That takes away the large need of moving resources out of the rural areas and there is an added benefit to having agriculture around. Farmer Matt Heimerich helped drive that idea home as he shared the affects buy-and-dry can have on a community. Heimerich farms in Crowley County, Colo., in the southeast part of the state. It was a county that relied on agriculture and had plenty of water for the farming community. In the 1960s, about 70 percent of the population in Crowley relied on farming as the primary income source. "Crowley is an extraordinary case of whatever can go wrong, will go wrong," he said. When the county started to struggle — stability is rare, if it ever exists, for agriculture — and that led some area farmers to sell water shares to cities such as Aurora or Colorado Springs. Heimerich said the money gained from sold shares didn't really go back into the community. Some farmers sold shares to the cities and leased back the water, but many used the money to pay off debts, retire or move out of the county. Summit organizers hoped the attendees came away from the conference understanding the connection between farmers, water and the food that they eat, especially the people who attended the event for the first time. Greg Peterson, executive director of the Colorado Ag Water Alliance said there were "a lot of familiar faces," from years past, but there also were a few of the roughly 200 in attendance who were new — both from farming and outside of it. ­— Fox is a reporter for The Fence Post. She can be reached at sfox@thefencepost.com, (970) 392-4410 or on Twitter @FoxonaFarm.